Enjoy the comfort of Blue Bay Divers' 8.5 metre Cougar Cat 'Bay Warrior', Byron Bay's most spacious and comfortable dive and snorkel boat. 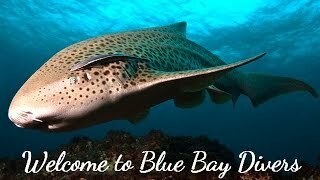 Blue Bay Divers' friendly professional charter service is conveniently located in the beautiful harbour of Brunswick Heads. Let them take you to fascinating dive destinations like Julian Rocks - one of Australia's top dive sites - but also places where no other operator goes, such as Windarra Banks, the Cape Pinnacle and many more dive sites in the Byron Bay area. With so many dive sites around, the crew at Blue Bay Divers strive to give you variety and excitement while catering to your experience level. Blue Bay Divers believe in good old fashioned customer service. Their team is dedicated to making your experience exciting but safe and offering the best personalised service possible.